The Midnight Moon Band has gone through many phases since its beginning in August 2010. It all began one night while Robin and her dad were out eating at a local restaurant. 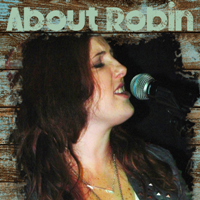 Robin had just disbanded with, 20 East, and was looking to continue with a new band; but first she would have to come up with a name and find dedicated people to work with. That night, they started talking about possible names for the band. They wanted a name that was unique and unheard of. After ruling out several different names they decided on Midnight Moon, which they later found out was also the name of Junior Johnson’s Midnight Moon Moonshine. Being avid NASCAR fans they knew that they had found the perfect name for the band. With the name of the band in place, Robin began putting the band together. The original Midnight Moon Band included Robin Dixon, Rhes Reeves, Brandon Bower, George Sandler and Mark Wright. They played as the house band at Coyotes Night Club in Augusta, Georgia until November 2011 when some of the members left to pursue other opportunities. The remaining members of the band tried to find replacements that could work together on a musical level and a stylistic level but were unsuccessful. As a result the band decided to take a break. After taking a year and a half long break, the band came back strong and is now better than ever with new members.